The 1 kb DNA Ladder is a ready-to-load molecular weight marker suitable for DNA fragment size determination on gel electrophoresis. 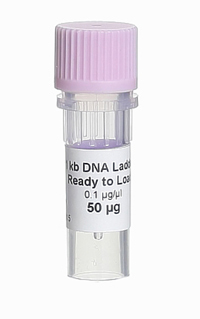 The 1 kb DNA Ladder is formulated to run accurately and to provide crisp band patterns. It contains two dyes: bromophenol blue and xylene cyanole which serve as visual aid to monitor the progress of migration during agarose gel electrophoresis. The 1 kb DNA Ladder contains 13 discrete DNA fragments ranging from 300 bp to 10,000 bp. 07-12-00050 50 µg 0.1 µg/ul PDF PDF PDF 15 EUR Login to buy! 10 mM EDTA, 10% glycerol, 0.015% bromophenol blue, 0.015% xylene cyanole and 0.17% SDS. Shipping and storage for up to 9 months at room temperature has no detrimental effects on the quality of this reagent. -20ºC is recommended for long term storage.